From the age of 20 until his death at 32, Alexander the Great and his armies from Greece swept across a vast region that included Persia, Asia Minor, Syria, and Egypt. Ultimately ruling an empire that stretched approximately 2 million square miles across three continents, Alexander revolutionized the way war was waged and extended the influence of classical Greek culture far beyond the borders of Greece and his native Macedonia. 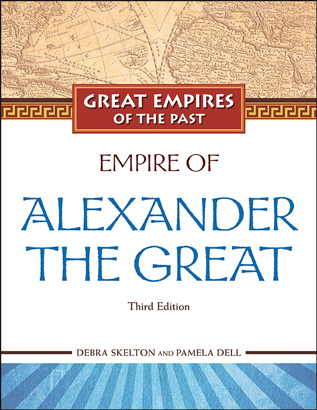 Featuring full-color photographs and maps, summaries of key people and key sites, a chronology, glossary, bibliography, and up-to-date further resources, Empire of Alexander the Great, Third Edition looks at what made Alexander a brilliant military tactician and a charismatic leader. It also explores what the Eastern world learned through contact with Alexander, and what Alexander brought to the West from the Persian Empire. Connections in our own world to Alexander's empire include the legend of the Gordian knot, pearls, the Egyptian metropolis of Alexandria, and the Septuagint, the first translation of the Torah from Hebrew. Debra Skelton began her writing career as a broadcast journalist. Her writing has appeared extensively in books, magazines, and a variety of educational media. Pamela Dell is the author of more than 40 books for children, including biographies, historical fiction, and science and social studies topics. She has written educational materials for, among others, Encyclopaedia Britannica and World Book, Inc., and is the creator and author of award-winning children's entertainment software titles.